Apples and Cherries and the Jet Stream, Oh My! After my last blog, I promised myself that I would not write anything else about climate change for a while [the whole beating-a-dead-horse thing]. But then I went and did something silly; I attended TRC’s 5th Annual Meeting where Peter Sinclair was the featured speaker. He has now spoken twice at TRC events and, for my money he is one of the most persuasive speakers out there on the subject of climate change. Contrary to the headline that The Paw Paw Courier-Leader ran, he is NOT a climate skeptic. In fact, his main claim to fame is his website called “Climate Denial Crock of the Week” at climatecrocks.com. Sinclair makes it his business to consult with scientists in various fields and then uses their research to refute unscientific assertions that there is no such thing as human influenced global climate change. One of the things I really like about Sinclair’s approach is that he readily admits that he has no expertise in climate science and that he relies on experts in the fields of climatology, physics, oceanography, meteorology, glaciology, etc. for his information. What Sinclair is really good at is taking complex scientific information and presenting that data in a format that even a lay person like me can understand. Watching his presentation is a little like watching the film, “An Inconvenient Truth” without the slick Hollywood feel [and Al Gore baggage]. Sinclair spent part of last summer in Greenland with scientists attempting to assess and measure the loss of ice on the world’s second biggest ice sheet. He presented video footage shot from an airplane showing the surface of the Greenland ice sheet riddled with melt-water streams that appear to be slowly eroding the core of the mile thick ice sheet. Even more riveting were his maps showing the extent of the thinning of permanent sea ice on the Arctic Ocean over the last 30 years. Basically, most of the old, thick ice at the North Pole is gone and only a thin remnant remains. It seems inevitable that in the next few years there will be an open water summer in the Arctic. This will likely have a disproportionate effect on global temperatures because ice reflects more sunlight [and heat] while open water reflects less sunlight and absorbs much more heat. Already a tremendous amount of energy is being trapped by greenhouse gases [primarily carbon dioxide] and reflected back to the surface of the planet. The quantity is staggering: the equivalent of 400,000 Hiroshima size nuclear explosions every day. And 93% of this increased energy is being absorbed by our oceans. Combine this with the increased acidity of the oceans due to CO2 uptake and it is no wonder that coral reefs are dying all around the world. Now if you are like me, you probably assume that climate change is something that is going to happen to somebody else…somebody who wasn’t so lucky as to have ancestors who settled near the shores of the greatest freshwater system in the world [and far away from rising oceans]. Unfortunately for my peace of mind, TRC had asked Sinclair to speak specifically about potential effects of climate change here in Michigan and one of his graphs was unforgettable. 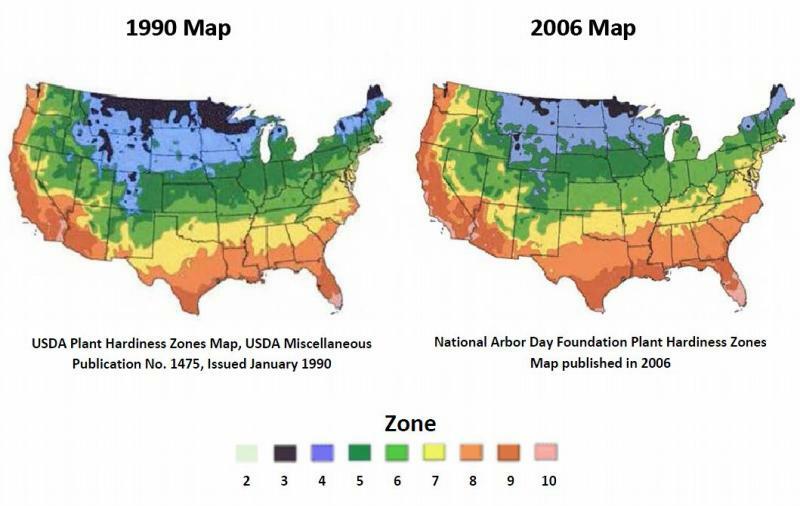 To illustrate the point that climate change will make Michigan both hotter and drier in the future, he gradually moved an image of Michigan south and west superimposed on a map of the U.S. 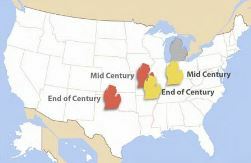 If we immediately start making significant changes in the amount of greenhouse gases released into the atmosphere, Michigan shifts down to somewhere between Illinois and Indiana by mid-century and further south to Missouri by the end of the 21st century. That is best case scenario. If we continue the business-as-usual model with no efforts to reduce carbon emissions, Michigan is between Missouri and Arkansas by mid-century and ends up in North Texas by century end. The room full of people became very silent as everyone contemplated a summer where every day was in the 90’s with high humidity. I was remembering the heat wave that greeted me in July 2012 when I returned home after a year in China and tried to wrap my head around weather like that as the norm. But then Sinclair said something that really grabbed my attention. He started talking about the failure of the fruit crop here in Michigan in 2012. He began by asking us old-timers if we could remember warm days in March when the breeze came out of the South, there was the first hint of spring in the air, girls would go outside wearing shorts and halter-tops, and boys would follow them appreciatively. Then he reminded us what always happened next: after a warm day or two, the wind would shift around and come out of the North, it would get damn cold, and girls would put their thick sweaters and long pants back on. But in March of 2012 something extraordinary happened in Michigan. It didn’t warm up a little for a day or two; it got hot and stayed that way for a couple weeks. Of course we know the rest of the story: the fruit trees were tricked into blooming early and then, finally, the weather changed and there was a killing frost of record proportions in terms of the loss of cherries, apples, peaches, grapes, you name it. However, what he said next was news to me; at the same time Michigan was setting all-time highs for March temperatures, Arizona and New Mexico were setting records for low temperatures and high amounts of snowfall. 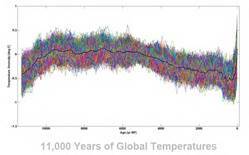 Are these just perverse anomalies or is there a link to global climate change? Sinclair persuasively makes the case for the link and its name is the jet stream. We all think we know something about the jet stream: it blows from west to east very high in the atmosphere and is the reason you can fly from L.A. to New York quicker than you can make the return trip. More importantly, the jet stream is why most of our weather patterns on the North American continent move from west to east. What powers the jet stream is the huge temperature difference between the cold air mass over the frigid Arctic and the warm air mass over the equatorial region. So what happens when the Arctic air mass isn’t quite as cold as usual? There is less of a temperature differential between the north and south and the jet stream weakens. Instead of blowing fast and relatively straight through the upper atmosphere, it slows down and starts to make huge sweeping turns north and south through the continent. Sinclair showed some maps of the jet stream in 2012 and it resembled a map of the Paw Paw River with huge meanders. These snaking bends or “kinks” can cause weather systems to become trapped in place and remain virtually stationary for weeks at a time. So in March 2012, the northern bend of the jet stream stalled over Michigan allowing a mass of warm air from the Gulf of Mexico to sit here for weeks dooming our fruit crop. At the same time, the southern bend was over Arizona allowing an Arctic air mass to stall there dumping snow for weeks. Was this a mere statistical outlier, a one-time phenomenon never to be repeated? Sinclair says these kinks in the jet stream causing extreme weather systems to stall and remain stationary appear to be happening more often. He showed pictures of Pakistan in August 2010 when the worst monsoon season ever caused flooding so severe that 25% of the population was homeless at one time. At the same time, Russia was having its worst heat wave ever. Listening to Sinclair, I thought back to the horrible heat wave and drought in the summer of 2012 when it seemed as if the weather was never going to change. Maybe stalled weather systems caused by a weakened jet stream are the new normal. 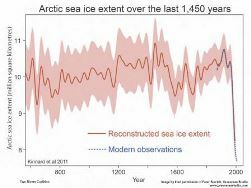 And how much worse may it get if the Arctic becomes ice free in the summer? Sinclair’s message couldn’t be clearer: global climate change isn’t just happening to unlucky people living at sea level on the Maldive Islands. And it’s not just something that our grandkids will have to deal with in a few decades; its effects are already present and will certainly become even more pronounced in our lifetimes. Post Script: I wrote this blog back in December, before the Great Blizzard of January 2014. Since I was snowed in for days at the end of my quarter mile driveway, I had a lot of time to contemplate the two feet of snow, howling winds, and below zero temperatures. At first I thought it was just a blizzard, the kind that I remembered from childhood. For instance, I remember back in 1967 my dad pulled me on a toboggan through the drifts from married housing at W.M.U. to the grocery store and back. In 1978, I was a student at Kalamazoo College and we couldn’t even get out of the dorm to the cafeteria for a day. Back to the present, all the weather forecasters were talking about the polar vortex. What they meant was that a great circulating mass of frigid polar air had left the Arctic region and headed south into Canada and the U.S. Normally, this mass of frigid air stays at the North Pole trapped there by fierce jet stream winds. But in January 2014, those winds were weak enough for the polar air mass to break out. In fact, the polar air mass split into two pieces, heading into North America and Eurasia respectively. According to the magazine “New Scientist”, our polar vortex blizzard was a result of weakened jet stream winds. Perhaps you can’t prove beyond a shadow of a doubt that this weather event was directly caused by global warming, but it sure seems plausible. Meanwhile, California is having its worst drought in over 100 years. Only a scant amount of precipitation has fallen [as either rain or snow] over the last 14 months. The meteorologists all agree that the reason for this is an unusual high pressure system over the Pacific Ocean that is blocking the normal track of winter storms which usually bring rain to the coast and huge amounts of snow to the Sierra Nevada Mountains. This high pressure system has stalled over the Pacific for so long that some fear it may be become a semi-permanent feature. Some California farmers are already letting their fields lay fallow this year, while fruit and nut farmers are desperately trying to pump more water out of the aquifers. Stay tuned as this climate crisis unfolds. Bottom line: The new normal seems to be the possibility of extreme weather [heat, cold, wind, rain, snow] and stalled weather systems at any time and any place. Post Post Script: Recently I attended lectures by environmental activists Bill McKibben of 350.org and Winona LaDuke of HonorEarth.org. They both mentioned the three numbers that every thinking person should know. The first number is 2 degrees C. This is the most widely accepted figure for the absolute maximum rise in global temperature that is possible without triggering complete climate chaos. The average global temperature has already risen .8 degrees C. over the last century. More significantly, there is already enough excess heat in the oceans to raise the temperature another .8 degrees C. In other words, we have already used up 1.6 degrees of our potential 2 degree budget. The second number is 565 gigatons. This is the amount of carbon [oil, coal, natural gas] that, if burned, will raise the global temperature past the threshold increase of 2 degrees C. Turns out that we will burn this much carbon in approximately 15 years at the current rate. The third number is 2795 gigatons. This is the amount of carbon in already discovered and proven reserves owned by the big energy companies and certain oil states [like Venezuela]. Not only are these reserves owned, they are also on the books as assets in the sense that the reserves are factored into the share price of stock in the big energy companies. I don’t know about you, but I find it truly frightening that we are planning to burn 5 times more carbon than what it will take to push the human race into oblivion. Have a nice day!